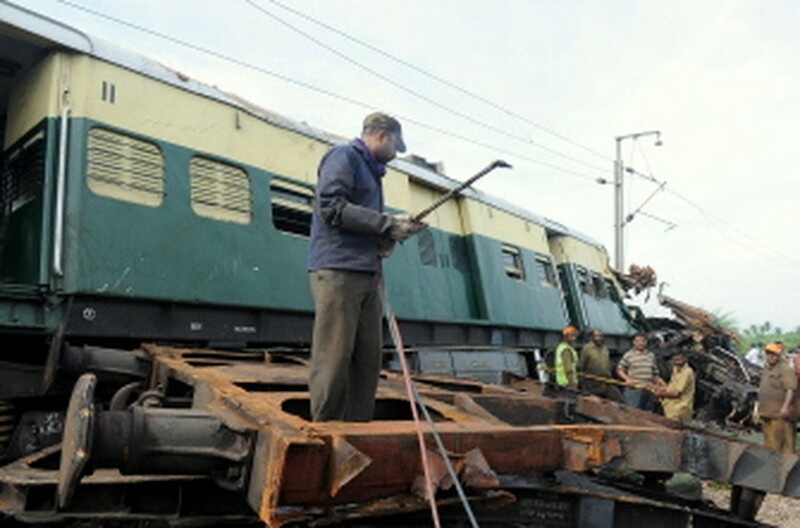 ARAKKONAM, India, Sept 14, 2011 (AFP) - Indian railway officials Wednesday blamed driver error for a late-night collision between two passenger trains that killed nine people and injured more than 80. Tuesday's crash saw a speeding train ram into a stationary one at a station near Arakkonam, about 55 miles (90 kilometres) from Chennai, in the southern state of Tamil Nadu. Emergency teams worked Wednesday to clear the crash site, where five coaches were derailed in the impact. Southern Railway general manager Deepak Krishnan said initial investigations suggested the driver of the moving train, who survived the crash, had ignored speed restrictions and signal lights. "Normally the previous signal would be danger (red). But apparently the... train driver has not adhered to the signal," Krishnan told the Press Trust of India news agency. India's creaking state-run railway system -- still the main form of long-distance travel despite fierce competition from private airlines -- carries 18.5 million people every day. The last major accident occurred in July, when a packed express train travelling from Kolkata to New Delhi derailed at high speed in the northern state of Uttar Pradesh, killing 63 people.